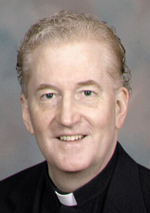 Father Dennis G. Van Thuyne, 64, a former pastor at St. Francis Xavier -the Oratory in Philadelphia, died Nov. 28. He was born March 23, 1951, the son of the late Gerald C. and Alice K. (Marks) Van Thuyne in St. Helena Parish, for which he had a lasting affection. He attended St. Helena School and Cardinal Dougherty High School before entering St. Charles Borromeo Seminary. Ordained May 21, 1977 by Cardinal John Krol at the Cathedral Basilica of SS. Peter and Paul, his first assignment was as parochial vicar at St. Edmond Parish in Philadelphia. He also served at Holy Child, Philadelphia; St. Patrick, Kennett Square; Nativity B.V.M., Philadelphia; St. Anthony of Padua, Ambler; St. Luke the Evangelist, Glenside; St. Clement, Philadelphia; and St. Ephrem, Bensalem, as well as pastor at St. Francis Xavier. Father Van Thuyne, who had health issues, including head trauma from a fall, was not in active ministry in recent years. A funeral Mass for Father VanThuyne was held Dec. 4 at St. Helena Church. The principal celebrant will be Father Kennedy. Concelebrants include Msgr. Joseph Trinh and Msgr. Conway, who will be the homilist. Father Van Thuyne is survived by his brothers Joseph (Diana), Michael (Phyllis, Paul (Tina) and sister, Maureen Gunn (Robert) and nieces and nephews. Interment will be at Holy Sepulchre Cemetery.